Web of Science: What are popular beliefs, and how do popular beliefs in Iceland differ from those elsewhere in Scandinavia? What are popular beliefs, and how do popular beliefs in Iceland differ from those elsewhere in Scandinavia? The terms popular belief and folk belief are used to describe quasi-religious beliefs of various kinds that generally fall outside the recognised religions but which are bound up with the culture and customs of ordinary people. They often take the form of a belief in various kinds of supernatural phenomena which can become manifest to humans under certain conditions and which people seek to explain by reference to religion. There is nothing particularly ‘national’ about the popular beliefs of any country. The popular beliefs of the Icelanders show many similarities to those of other nations and are made up of elements brought to Iceland at the time of the settlements in the 9th and 10th centuries, some from mainland Scandinavia, some from the Viking settlements in the British Isles, combined with innovations and adaptations that have taken place since. For instance, the belief in settlements of outlaws living outside normal society appears in part to be peculiar to Iceland, and much in the Icelanders’ belief in elves and hidden people seems to owe more to popular beliefs in Ireland and Scotland than to anything found elsewhere in Scandinavia. This cultural mix tallies well with what the written sources tell us about the origins of the Icelanders, and also with modern genetic research showing that the Icelanders were a blend of different ethnicities from the very outset. There has been considerable discussion in recent years about the ‘genuineness’ of folk beliefs among ordinary people. According to Árni Björnsson, people at all times told stories involving popular beliefs largely for their entertainment value and relatively few of them believed them with any seriousness. Against this, Valdimar Hafstein has argued that there is good evidence to suggest that popular beliefs were indeed genuine and had actual influence on how people behaved. A broad overview of Icelandic popular beliefs can be found in the chapter by Jón Hnefill Aðalsteinsson in volume 5 of Íslenskr þjóðmenning (‘Folk culture in Iceland’) (1988). On the Gaelic connections, see Bo Almqvist’s essay ‘Gaelic/Norse folklore contacts: some reflections on their scope and character’, in Irland und Europa im Früheren Mittelalter (‘Ireland and Europe and the earlier Middle Ages’) (1996), pp. 139-172. 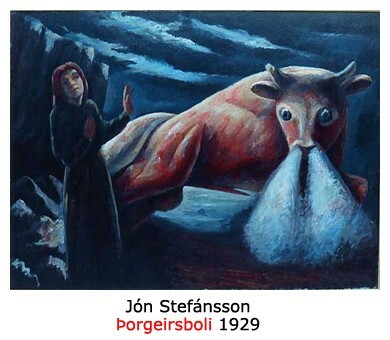 There are two books by Símon Jón Jóhannsson dealing with popular beliefs and ‘superstition’ in Iceland: Sjö, níu, þrettán (‘Seven, nine, thirteen’) (1993) and Stóra hjátrúarbókin (‘The big superstition book’) (1999). Árni Björnsson’s article ‘Hvað merkir þjóðtrú?’ (‘What does popular belief mean?’) appeared in the journal Skírnir in Spring 1996; for Valdimar Hafstein’s responses, see for instance ‘Respekt fyrir steinum: álfatrú og náttúrusýn’ (‘Respect for stones: belief in elves and view of nature’) in Rannsóknum í félagsvísindum , vol. 2 (1998). Gísli Sigurðsson. „What are popular beliefs, and how do popular beliefs in Iceland differ from those elsewhere in Scandinavia?“. The Icelandic Web of Science 5.3.2005. http://why.is/svar.php?id=4800. (Skoðað 21.4.2019).